I found this fascinating. In Robert Tombs’ The English and Their History, I came across a line that act ually caused me to think of Richard III in a new light. Hard to do, considering the dozens of histories and novels I have read that exhaustively discuss Richard III’s villainous (and short) reign as king of England from 1483 to 1485. 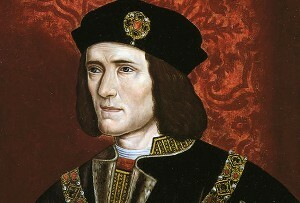 Richard III was the youngest brother of Edward IV, whose fortunes had dramatic ups and downs for many years during the battles of the Wars of the Roses. For over ten years, the realm had been in steady hands. All threats had been eliminated (including the traitorous middle brother, George, Duke of Clarence). However, although in his youth Edward IV had been a strong, healthy warrior, during peacetime he was a careless womanizer whom many historians like to claim ruined his health. He died of disease at age forty. This put England back in the place it had been twice in that century, with the crown—with all its religious symbolism regarding divine right and inheritance—going to an underage boy. The previous two kings who had inherited as mere children had eventually been overthrown and (probably) murdered by their rivals. Even so, there was a strong belief throughout the kingdom—including among the nobility—that kingly rule was divinely inherited. Thus, the young Edward V, only twelve years old, was fully accepted as the king, regrettable though his youth was. We all know what happened. Instead of accepting his role as Lord Protector to the new young king, Richard usurped the throne, had the boy king put in the Tower ostensibly to get ready for his coronation, and then had him declared illegitimate. Soon after, the child and his only brother vanished, presumably murdered. Richard III is commonly blamed for these murders, but the over-the-top villainous glee Richard III displays in Shakespeare’s play of the same name has been popularly balanced out by Josephine Tey’s detective novel, The Daughter of Time, which makes a strong case that Richard wasn’t a monster and did not order the boys’ death. Nevertheless, he had the children declared illegitimate by claiming the widowed queen’s marriage to Edward IV was bigamous. Richard seized the throne by quickly executing key players (including the boys’ uncle, a noted scholar) without more than a quick trial or without any trial at all, and Richard III ruled by terror. So outraged were people that Henry Tudor, who had a very tenuous claim to the throne and had lived most of his life abroad, was invited back to England to claim the throne for himself. To cement his claim, he was to marry Edward IV’s eldest daughter, Elizabeth of York, thus giving their children a fairly strong claim to the throne. Richard Plantagenet had spent his whole life fighting the seesaw Wars of the Roses, both in power alongside his elder brothers, and barely escaping death and going into exile with them, and then back in power and having to deal with betrayal by his middle brother, George. We’re all used to thinking of Richard III as this sneaky conniver, but think of him as the youngest son, the last surviving male in his immediate family, and someone who thought himself ranged against a host of Woodvilles, the male relatives of the dowager queen, his sister-in-law. Since her marriage to Edward IV, the Woodvilles had done their best to move up in the world with her. They were viewed as rapacious, and were quite unpopular with the aristocrats of higher rank and origin. To modern eyes, this can seem fairly ridiculous, since all of these people actually were related to each other by various marriages. Yet to them, rank was crucial, origin was immutable, and influence meant lands, advantageous marriages, and increases in worldly power, money, and consequence. Elizabeth Woodville was of gentle, noble birth, but she was not royal, and that was held against her forever. Still, she had ensured that much power and influence accrued to her male relatives, her “affinity,” as they called it, during her husband’s reign. So, Richard panicked. And took action. Tombs rather cavalierly claims that of course Richard III did have his nephews, the famous “princes in the Tower,” murdered. Looking back to what this branch of the royal family did to the half-insane and childlike Lancastrian king, Henry VI—murdered him in the Tower—this murder of two children seems likely. Although I’ve enjoyed the various versions of this period of history that attempt to restore Richard III’s honor, the fact is that he had several key nobles murdered without any due process. Stooping to having his nephews killed therefore doesn’t seem implausible. The weird thing is, when we’re looking for excuses for Richard III, we tend to ignore these blatant and inexcusable murders of grown men who had done nothing against him. Not yet, anyway. That’s the catch, isn’t it? Richard III grew up in tough times and could reasonably expect that even though he had been named the Lord Protector (the regent or de facto ruler during his nephew’s minority) by his brother’s will, the powerful Woodville faction might act against him. It almost certainly would, because self-aggrandizement was the name of the game back then. Still is. As for murdering one’s foes, judicial murder was a specialty of the Tudors, but they weren’t in power yet, so Richard III did what typically was done in his era: get the other guy before the other guy got him. Because he panicked. Fascinating new angle.